I want to introduce you to C&D'S Installers, Inc. 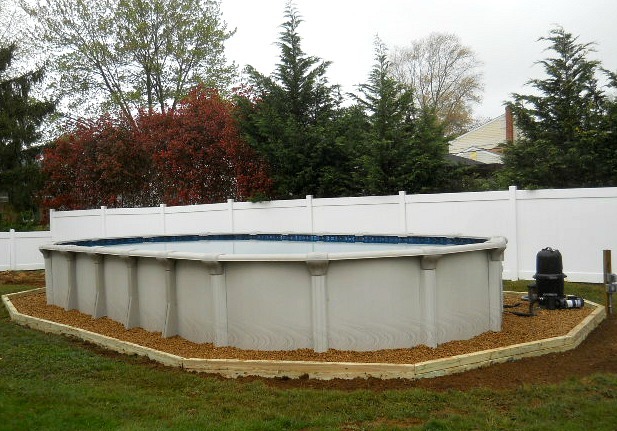 They provide above ground pool installation services in the states of Maryland, Pennsylvania, Delaware and New Jersey. The company is owned by Cynthia and Dwight Harmon. They started the company back in 1995 and have continued to grow beyond their home state of Maryland. Their mission statement is much like my own, "Our goal is to provide a quality service and a finished product you will enjoy for many years to come." Dwight was kind enough to provide me with plenty of photos of his work and I wanted to make comments on some of them, so let's get started. This is how a typical installation looks when the installers are done. 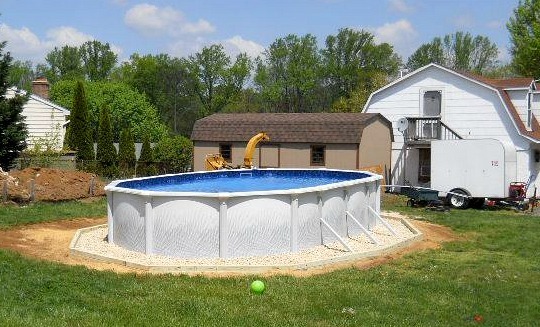 This is done just like all my installations with plenty of grass cleared, and dirt leveled, beyond the pool area. 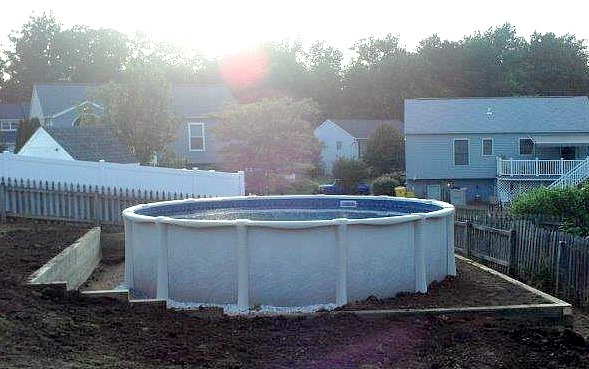 The photo below shows how the pool should look after a couple of weeks. 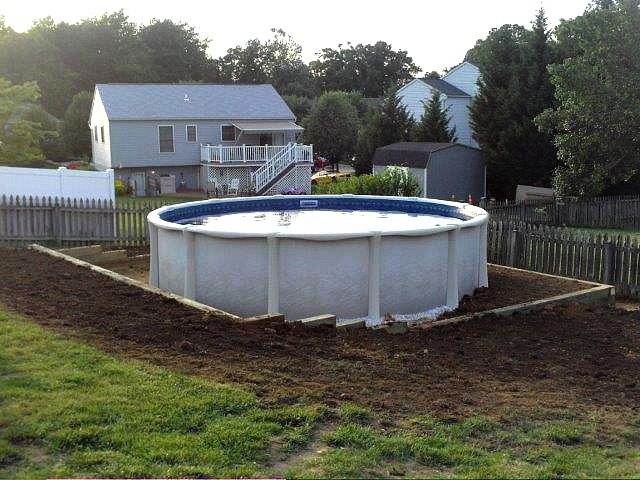 Keeping all the vegetation away from the pool is one of the most important things a new pool owner can do and rock landscaping like this is one of the best ways to do it. C&D'S Installers provides this service. It's an option you can add onto your installation but one worth considering. This is so important I wanted to say it twice, this is just after the installation. This is just after the landscaping. The grass will grow back to the landscape border but not against, or under, the pool. 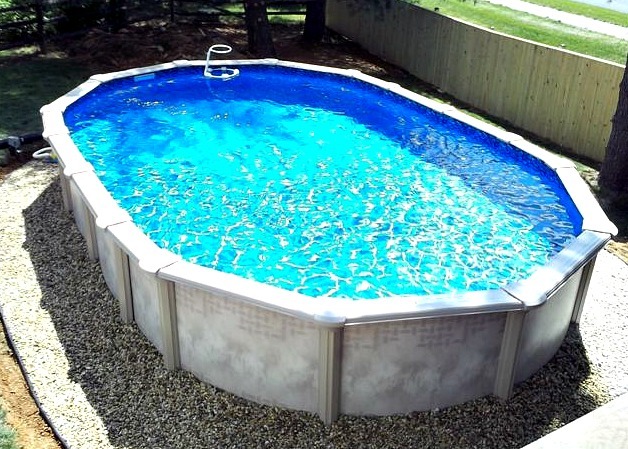 The next three pools are oval installations. 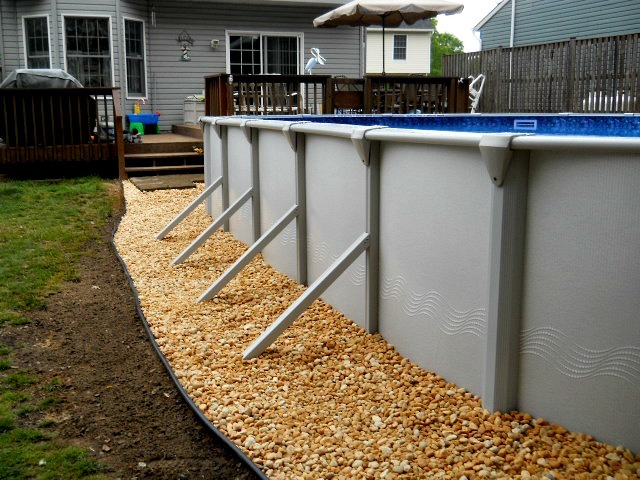 They all feature the landscaping around the outside, just how an above ground pool should look. 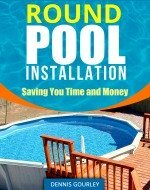 Oval pool installations are what separate the bad installers from the good ones. The good ones, like these done by C&D'S Installers, are level with perfectly straight sides. It is so easy for inexperienced installers to rush through setting the braces and wind up with a big mess. I hear about it all the time. 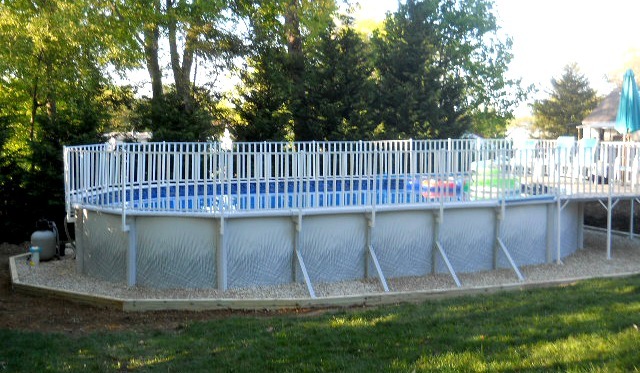 An oval pool with fencing is the ultimate challenge. 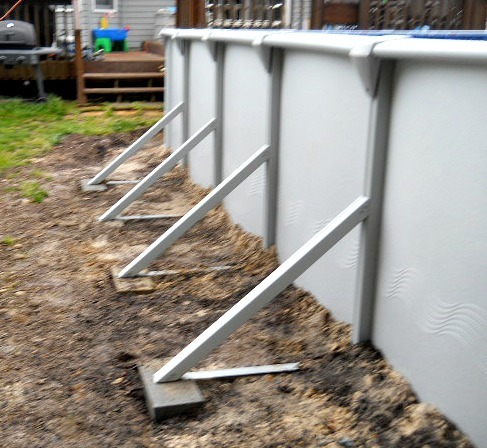 If the pool is not level, and built with straight sides, the fencing will look awful. 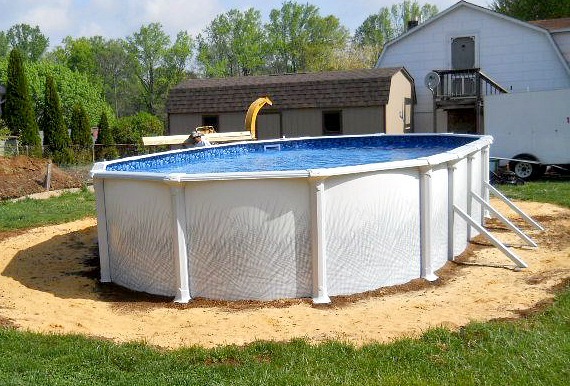 This pool looks like a perfect installation, a pool that can be enjoyed for many years. A lot of the questions I get in my question and answer section of this site have to do with leveling, especially leveling yards with a lot of slope. Here are a couple examples of leveling done right. I love the use of retaining walls to keep all the dirt in place. 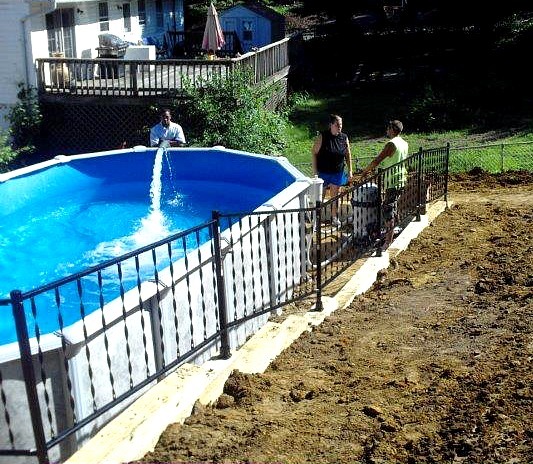 This looks like a lot of extra work but more than worth the effort if you want a pool that will be around year after year. This is another example of some extreme leveling and the use of a retaining wall. This is an excellent job of leveling the ground and making sure it will stay in place. I love the fencing going up the wall. The work on this pool is still in progress as it is still being filled. 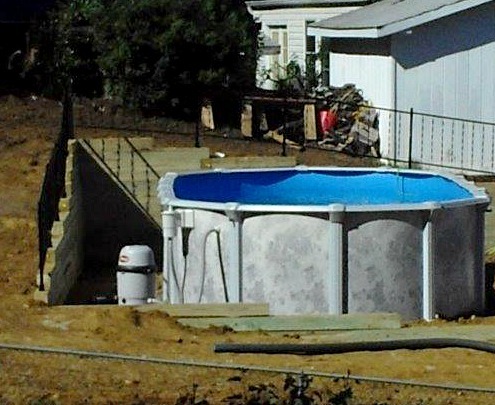 My guess is the fence will continue until the pool is childproof. That's a consideration I wish more parents would pay attention to. If a ladder is to remain in the pool when it's not in use it should look like this. That would be a little difficult for a child to climb. 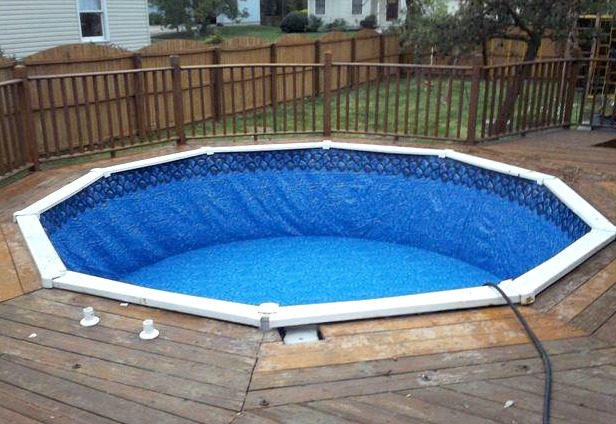 C&D'S Installers will install a new liner in your existing pool. 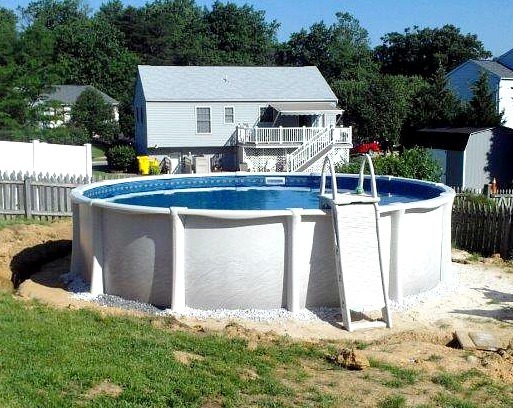 From time to time all above ground pools need new vinyl installed. If you don't have the knowledge or the time let the professionals handle it.